Sometimes when I see a pattern in a magazine it just drifts past my eyes as I acknowledge it's beauty, but unsuitability for my life. Other times I see a pattern and it sticks in my brain. It might not be suitable for my life but I just itch to own that garment or accessory. If it's not suitable, I generally let it go but remember it's qualities. Then we have the patterns that I MUST make one day. They sticksin my brain and refuse to leave. 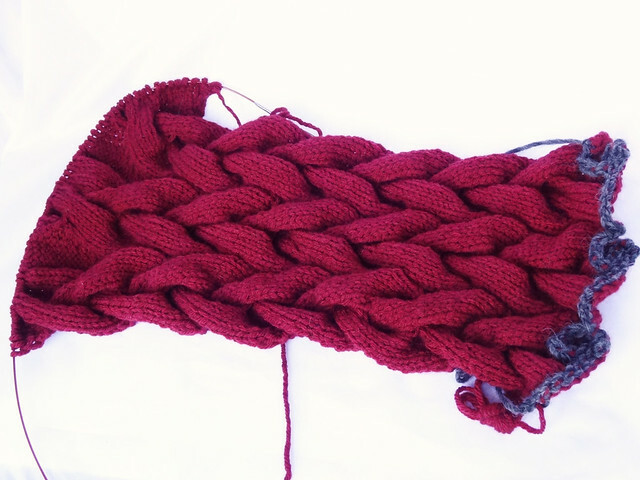 This is what happened with the cover photo from the very first edition of knit.wear Magazine, that came out in 2011. 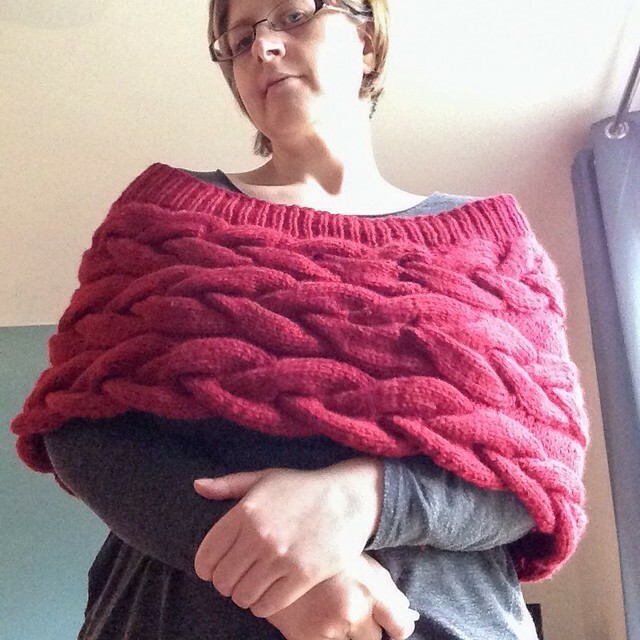 The Shaped Capelet with Braided Cables by Erica Patberg captured me and the image stuck with me in my subconscious until Deramores brought out a bulky range of yarn, Vintage Chunky. Deramore Vintage Chunky is made of 50% merino and 50% acrylic and it's real bargain. There was also a discount when it came out in Autumn 2013. With that discount and seeing that the yarn came in a very close colour match to the original cover shot of this lovely pattern, made me feel like it was meant to be. The yarn marinaded for a while and then I cast on in January 2014. The capelet is knit sideways, starting from a provisional cast on. 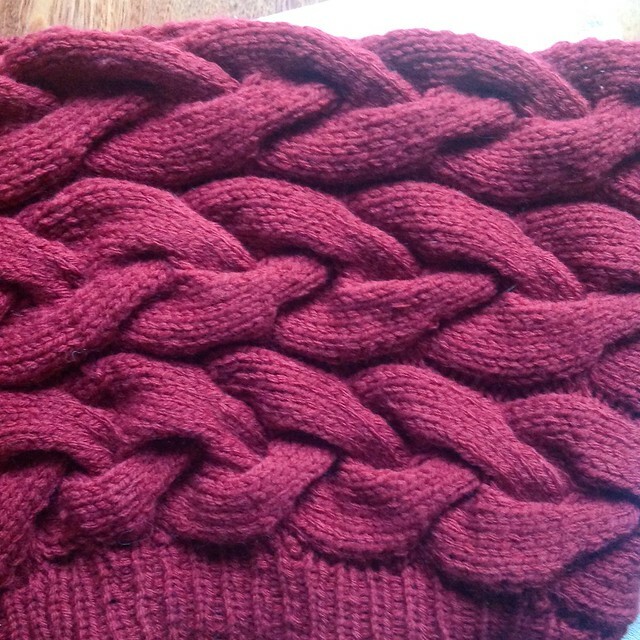 The chunky cables were a sheer delight to knit. I love the fabric that large cables make, especially when they are right next to each other. This dense area of cables sits at the front of the capelet. 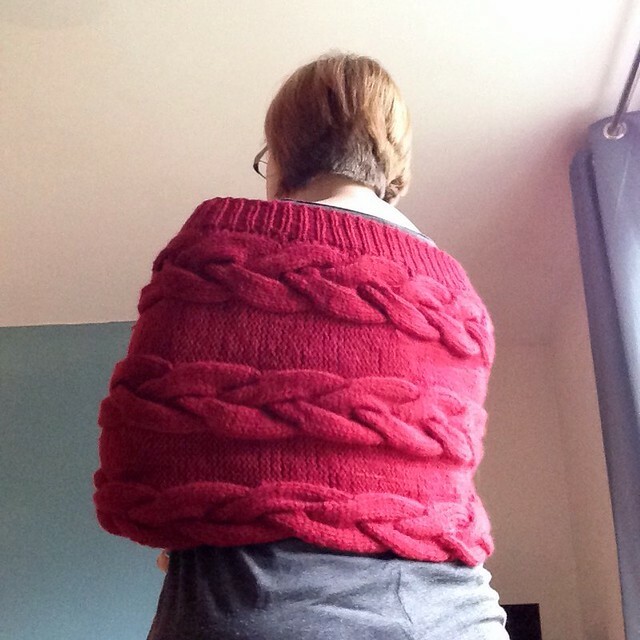 Then increases are placed between the cables to create a deeper capelet to sit at the back of the body. There is a large section of straight forward cabling with no increases as it passes around the body, before decreasing between the cables again. Then came the fun part of grafting those cables. Yes I had to do it more than once and yes there was swearing. I may have improved with my grafting over the last few years, but I don't think I'll ever be comfortable with grafting cables or lace. After my first failed attempt I took some time to count stitches and add stitch markers every so often on both sides of the graft. This meant I could ensure that the stitches were lined up as I went, rather than getting to the end to discover I'd gone awry somewhere. After grafting the capelet I just stopped. I put the capelet away and sulked because my lovely project obviously hated me. I didn't pick up the project until #WIPCrackAway happened, with the KnitBritish and Yarns From The Plain podcasts. This push towards getting some works in progress finished up, reminded me that I had this lovely capelet waiting to be finished, and all it needed was a band of ribbing! So picked up the stitches along the top edge of the capelet and ribbed for a couple of days and then it was finished. I can't believe it took me so long, to get around to this project. The capelet is a wonderful accessory and I have worn it a lot this Autumn and Winter. I love how it embraces you and keeps you snug whilst still giving you room to breathe. I haven't overheated once in this capelet. I do love it when an idealised image from a magazine, may not be completely duplicated, because of finances and lack of a professional photographer, but the project created is both lovely and useful. On top of the wonderful capelet that I got, I also won a prize from Louise of KnitBritish for my entries in #WIPCrackaway! 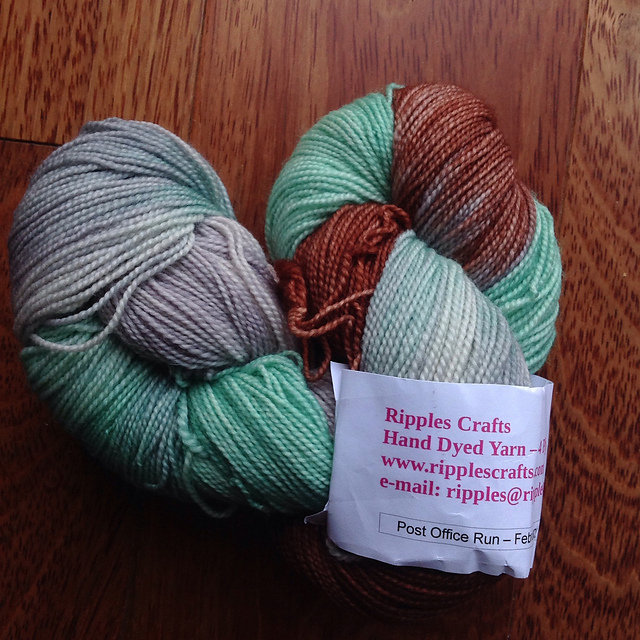 A skein of Superwash BFL Sock Yarn from Ripples Crafts. I love Blue Face Leicester sock yarn. It's wonderful stuff and make your feet feel cosseted. I can't wait to make this into socks. Basically though this project took a long time, from initial attraction to finished article, it really was a triumph all round. I also have two skeins of my Deramores Vintage Chunky left. I'm very tempted to make some warm and squishy mittens to match my capelet!